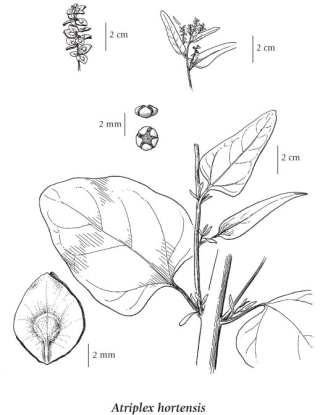 Annual herb from a taproot; stems decumbent to erect, freely branched, mostly 0.6-2.5 m tall/long. Lower leaves opposite, upper leaves alternate, stalked or stalkless, broadly lanceolate to egg-shaped, 5-20 cm long, 2-10 cm wide, blunt to arrowhead-shaped at the base, smooth or slightly toothed or undulate, covered with a whitish mealy substance when young but becoming glabrous and greenish with maturity. Inflorescence of terminal or axillary spikes or panicles; pistillate flowers of 3 kinds, one with a small calyx and no bracteoles, one with small rounded bracteoles and the third with no calyx but 2 large, 6-12 mm wide, rounded bracteoles, these without teeth, veins merging above the base. Membranous pericarps; seeds of the pistillate flowers without bracteoles, horizontal, small, black, those of the pistillate flowers with more or less heart-shaped bracteoles or the bracteoles rounded at the base, vertical, black or brown and about 2 mm wide. Mesic to dry roadsides and waste places in the lowland, steppe and montane zones; infrequent garden escape in S BC; introduced from Asia. 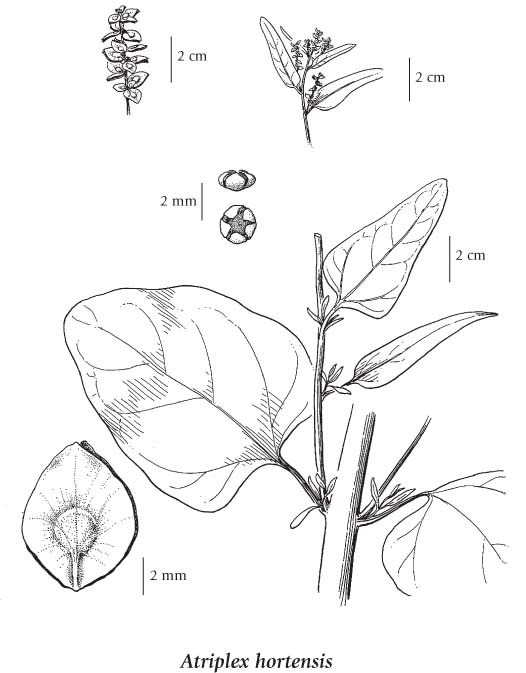 Atriplex acuminata Waldst. & Kit. Atriplex hortensis var. atrosanguinea hort. Atriplex hortensis var. rubra L.
Atriplex nitens Schkuhr nom. illeg.